Helge's profound experience and knowledge gained in the course of his many travels, coupled with what we learn from our own bikes, and those of our clients on tour, make us uniquely qualified to know what works, what doesn't, and what to do when things go wrong in the field. In cooperation with our sponsors listed below, we have distilled that know-how and road savvy and have produced our new R1200GS Adventure Touring Instructional DVD. The R1200GS DVD covers the many aspects of accessory selection, bike prep and outfitting, tire puncture repair, tool selection, what we've learned about the new CANbus system, and the many aspects of adventuring on BMW's flagship global tourer. The R1200GS DVD is a 4-hour, 2-disc set, and includes bonus chapters on the BMW HP2, and an R1200GS/EZS adventure touring sidecar. 12) BONUS: HP2 with Modifications - Helge shows his new HP2 and its special modifications in preparation for the GlobeRiders Indochina Expedition. Again, a special thanks to our sponsors (listed in alphabetical order below) for their support in this special Project. Direct order links and/or contact information is provided for ordering from each sponsor. Sandia BMW Motorcycles is a dealership specializing in all that is in the motorycle. A new dealership in the state of New Mexico, but veterans when it comes to the business and BMW Motorcycles themselves. The employees alone fill the parking lot with their personal bikes, ranging from vintage R75/5's to the new 1200 GS motorcycles. On sundays you are likely to see the staff enjoying the New Mexico air on their many rides out. From GS trails throughout New Mexico or participating in events at Sandia Motor Speedway, they are no strangers to the joys of owning a BMW Motorcycle. To order the GlobeRiders BMW R1200GS Adventure Touring Instructional DVD and our other books, videos and DVDs, please click on the DVD cover artwork above, or please click here. Sierra BMW is a family owned, fully authorized BMW Motorcycle Retail Center. We are a single-line dealer featuring BMW Motorcycles and BMW Parts, Accessories, and Apparel. We concentrate and focus on BMW Motorcycles only. We specialize in Customer Service. In every department, you'll find experienced people that are committed to customer service and motorcycling. We will provide you with knowledge and assistance without pressure. We will strive to give you the information that you need to make educated buying decisions. We are here for one reason, to help you. Sierra BMW is your source for BMW Motorcycle Parts, Accessories, Apparel, and Performance. Whatever your style, whether you enjoy relaxed cruising, touring, dual-sport, or sport riding, we have something for you. We even stock hard-to-find Long-Distance and Adventure Touring Accessories. We've searched far and wide for original and aftermarket riding solutions that fit your special needs. We offer only the highest quality products and we stand behind every item we sell. 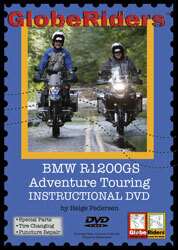 To order the GlobeRiders BMW R1200GS Adventure Touring Instructional DVD, please click on the DVD cover artwork above, or please click here. Touratech-USA is the North American distributor for the full line of Touratech touring, rally, and adventure motorcycling parts and accessories. In addition, we specialize in Garmin GPS receiver and mapping products. We are now located in our own building on Airport Way in Seattle, Washington. We invite you to stop by our showroom, where you can find not only our products, but also view the growing stable of accessorized dual-sport and adventure touring motorcycles we have on display.